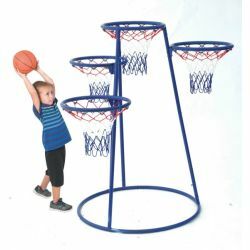 Children develop hand-eye coordination as they hoop it up with this sturdy metal basketball stand. Four 18″ diameter hoops at varying heights accommodate children of all sizes. 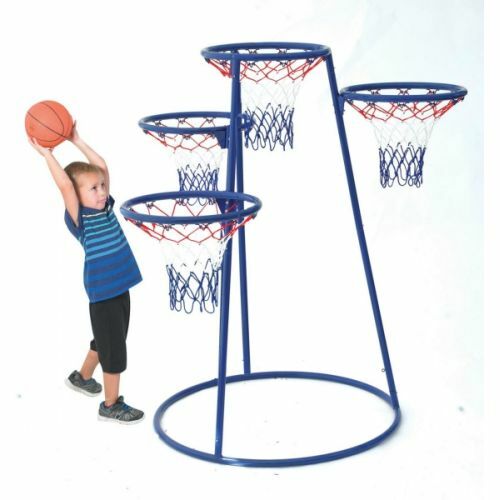 Basketball stand features 36″ diameter non-tip base and powder coated metal frame to resist rust. An included bag fits into the bottom of the stand to store balls when basketball stand is not in use. Can be used indoors and outdoors. Easy assembly is required. Replacement storage bag and nets are available. Ball not included. Measures 48" x 36" x 54".